I can just see you trying to pull this one on your boys! Believe it or not: my youngest has been playing Sandman in his sandbox all week (perhaps the cartoon has inspired him). 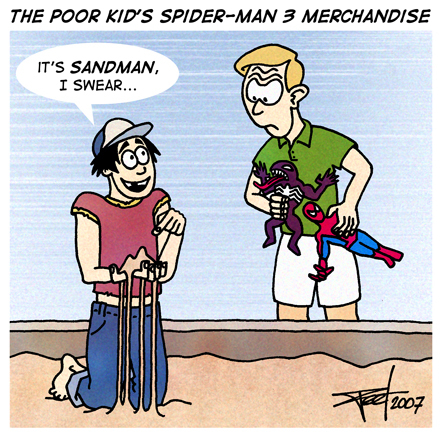 Don’t worry: He’s got an actual Sandman figure to play with, too. But he’s not allowed to take that one in the sandbox… It’s too expensive, you see. This is an excellent comic…I love it…it’s truly hilarious and imaginable. You mean the Spider-Man comic, right? 😉 Thanks for the feedback, RC.